When I was growing up I never had a Christmas tree, partly because it was not part of the Spanish tradition, which used to favour the manger, but partly because in my house we were not great at celebrations or decorating the house for the occasion. This would explain why I am not particularly attach to the idea of having a tree in the house. I really enjoy seeing the decorations when we go out, particularly all the lights and the lit trees outside so I would be more in favour of having a lit tree outside in the garden instead of one in the house. We also have a small sitting room with no much space for a tree. However, I ended up with a big tree inside. How did that happen? This year I decided to put up the Christmas tree for the first time since my daughter was born. Not that I used to put it up before. I didn’t. My daughter is now 4 and I thought that she is old enough that she would enjoy putting up the decorations. I also wanted her to experience Christmas and celebrating but without being a meaningless form. I wanted to create family traditions that brings us closer and that have meaning for us, without following the consumerism of the season. So I thought that putting up the tree decorations would be a good activity for November and a way to keep her amused. Still I had a dilemma because I didn’t want to buy the typical Christmas tree, whether plastic or real. I find it a bit meaningless, to go out and get a tree in the house, a kind of artifice, product of the consumer society. Everyone in masse buying trees and everyone discarding by the beginning of the New Year. Why do we do it? Where did this tradition come from anyway? Does it have any meaning? So I started thinking how I could have a tree without having the typical tree. An idea came up. I thought of getting a few branches from the bare trees in the garden and make it look like the trees outside. I really liked the idea because it was more appropriate to the season and replicates what is happening outside, trees have shed their leaves. A bare tree also shows off the decorations much more. You can really see them. I ended up getting my husband to cut 3 branches. I then assembled them in whatever way I could. We started putting up a few decorations I had from years back. I found a couple of wind chimes a bit broken but I thought they were quite appropriate for the tree since they were a butterfly and a dragonfly. I also added a bell I had. So our tree has sound, something I would never have thought of adding to a Christmas tree but I thought it was quite fun. 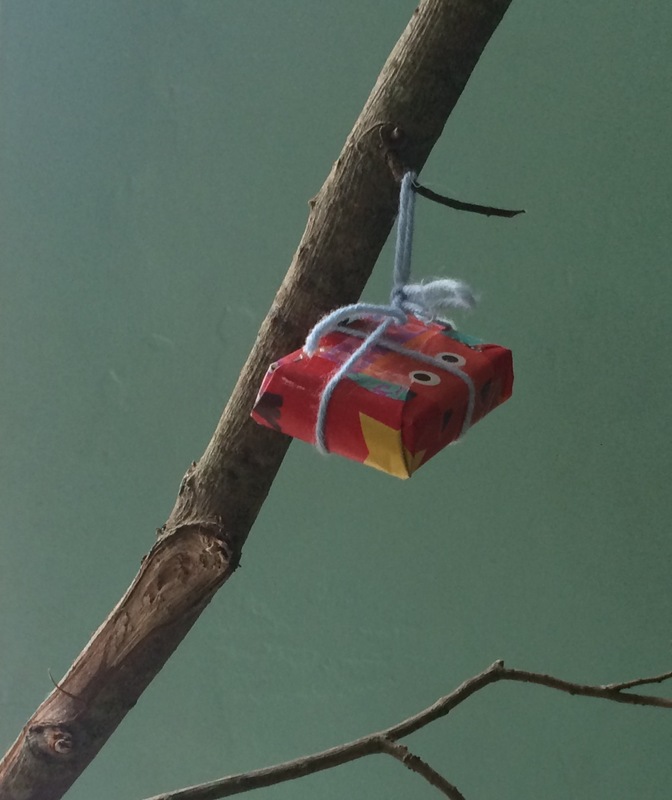 Every time we want to a bit of sound, we just go to the tree and shake it a bit and everything moves in it. She made a butterfly out of paper that also ended up in the tree. We spent most of November and December making decorations for the tree, on and off. I bought a couple of wooden decorations that we painted. My daughter chose to paint the stars and the tree in pink and a top layer of pink glue glitter. Initially, I had only bought two that I was going to use as bookmarks or something. I used them to cut a few more of them from the cardboard that comes as chocolate wrapper. I have a stash of them that I kept to do something with it. We painted them one side pink and on a different seating, my daughter chose old wrapping paper that I have kept from other occasions for the other side. I find it such a waste to throw it after just being used to wrap up your present and they are quite pretty so for the most part I tend to keep them in a box to do something with them. Days or weeks later, she came up with the idea that she wanted to make presents for the tree. She made me look for all the boxes I could find in the house. She did this activity with her dad over a few evenings. Apparently, he used to do this when he was a child. She picked the wrapping papers she liked the most. They used pieces of wool I had as the string around the packets. Small match boxes made cute little presents she loved so much they wouldn’t go up on the tree. She kept a few just to play with them. She came up with this game of gift giving by which she would give us a present each, to my husband and me. “Here is your present” she would say. “Do you like it?” “I love it” I would reply. She would come back a little later and ask back for the present. “I’ll mind it for you” she would say. Giraffe also got presents and her sheep Perfume got one too. She entertained herself in this way for many days and many hours at a time. For a child that wants to do something every 5 minutes this was a lot. Time and time again, I am always amazed at how the best games, the things that entertain her the most and plays the longest are never toys. I am amazed at how she is capable of creating her own games and entertain herself that way. All these activities are always directed by her. Otherwise, it won’t work if you ask her to do something or have activities prepared for her to do. At every stage, she decides what she wants to do. We made stars for the tree but two of them never made it to the tree because she loved them so much that she would play with them as if they were dolls, maybe the mammy and the baby and have full blown conversations with them while the real dolls were bored in one corner. She would give one to her father, “one for you and one for me”, only to ask for it later on. I was surprised by how much we got out of the Christmas tree already and it is not Christmas yet. Putting the decorations up was quite effortless since it happened in an organic way over days and weeks. I was really happy looking at these branches taking most of the space in our sitting room. The best thing? When Christmas ends, these three branches can go back into our garden. The traditional Christmas tree is a joy to look at one minute and, the next minute, is just a thing you need to get rid of, it has suddenly become a waste. Want to avoid waste? Consider a leafless tree, a few branches put together. You will be surprised at how much joy you get out of something so simple. I was. Update: The week before Christmas day and the games have changed: now she is unwrapping a few of the presents so we made more boxes. Wrap boxes with old wrapping paper. Make shapes. 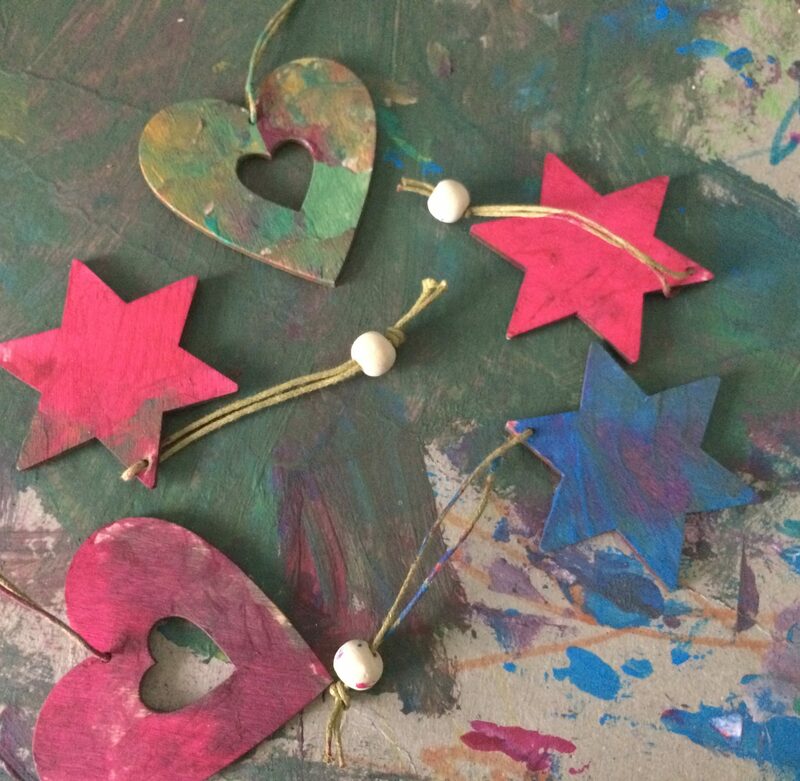 We made hearts, a tree and a few stars. Stars were the most popular. I use wooden decorations for the tree to make more shapes but you can also use cookie cutters or children’s shapes. I used a jewellery box to make the hearts. They make cute gift tags too. The aim is to let her pick colours and papers, although I ended up doing most of the cutting (she insists on cutting too) and then she painted them. I cut the papers and glue them. This Christmas don’t throw the wrapping paper. Use it for scrapbooking or any other activity with your children or yourself. Keep some of the boxes at least. Boxes are the best toy ever. Cardboard is great for craft activities and mulching the garden. If you don’t have a garden, maybe your gardening friends or neighbours would be interested in some cardboard. Gift tags or clothes tags can be used as decorations in the tree or reused as gift tags for future presents. The ribbons or metal chains can be used to hang decorations in the tree. Ribbons and string can be reused again. You may not use these things but consider giving them to people with children or creative people that may enjoy working with these materials. Pienso que es una gran idea, buscar alternativas más sostenibles a en este caso el árbol de Navidad. Además puede ser un proceso muy creativo y divertido.